AS BREXIT creeps ever closer, and with it the likelihood of a no deal crash out from Europe, a Shetland fish processor takes a philosophical approach as to whether or not his company will be able to export whitefish to Europe after 29 March. Robert Williamson of QA Fish said it was simply impossible to prepare for a situation that might only resolve itself in the final days of the Brexit countdown. “It doesn’t really feel that good, but there is not a hell of a lot I can do about it. We just need to carry on and see what happens. There is not much else you can do,” he said. QA Fish has just completed a £500,000 expansion to its existing premises at Blacksness Pier, in Scalloway, which – ironically – was part funded by money coming from the European Maritime and Fisheries Fund (EMFF). 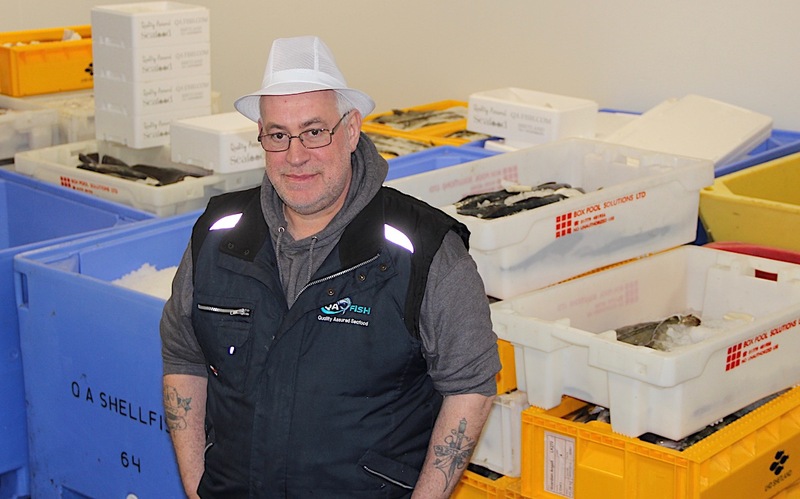 Over the last ten years, Williamson and others have built an export business based on the high quality and the ever-growing quantity of fish landed in Shetland since the introduction of the electronic seafood auction in 2003. Employing 28 people including seven EU citizens of whom one is a major shareholder in the company, QA Fish is today the largest whitefish and shellfish processor in the isles. The company buys fish every morning on the local markets, processes it in the factory ready for the overnight ferry to Aberdeen, from where it is driven to the distribution centre in Glasgow. From there it is being taken via the Channel tunnel to the Boulogne fish market, one of the major European distribution centres. It takes just 48 hours from buying on the Lerwick or Scalloway fish markets to arriving on the European market. But for fresh fish to reach European markets in prime condition every hold up on the long journey from Shetland to the north of France, such as the expected delays at border controls in the case of a no deal Brexit, will undermine the company’s ability to run a viable business. “There is a finite time to deliver to your customer; and we are never going to be the cheapest, but we manage to sell our product on the quality,” Williamson said. “If we start sending fish that is getting held up at the borders, and we are losing money on it, we’ll stop exporting. The company currently sells 40 per cent of its production to Europe; the remaining 60 per cent is sold within the UK. A sister company, QA Shellfish, is exporting live crab landed at Ullapool to customers in Shanghai, in China. Another worry Williamson has, and with him many other exporters of seafood, is the question if the local authority will have sufficient environmental health officers on standby to issue required health certificates on 30 March, should the UK leave the EU, and with it the single market, without a deal. Earlier this month, rural affair secretary Fergus Ewing warned that the requirement to have health certificates and other documentation in place in case of a no deal Brexit would create an extra cost burden of £15 million to seafood producers in Scotland. And local MSP Tavish Scott, speaking in the Scottish Parliament last week, described the consequences of a no-deal Brexit “not so much as a sea of opportunity as an ocean of red tape”. “If you had known six months ago what the deal is, then you could have been prepared for it. “We had more than two years now, and they still can get a deal in place, so how can you prepare for something that you are not exactly sure what it is going to be,” Williamson said.